We recently updated our living room with new furniture and quickly realized that the brown color scheme needed something to brighten up the area. I knew that lighting candles from Colonial Candle would make all the difference to enhance the décor. 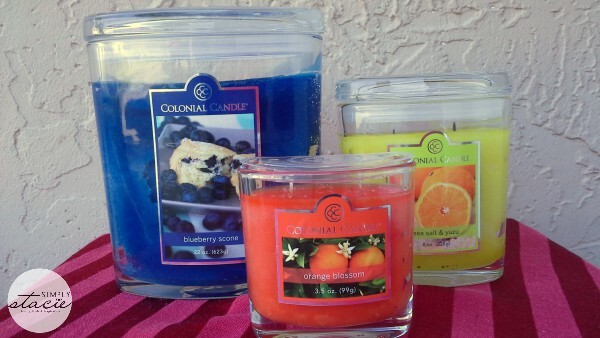 Colonial Candle has a wonderful selection of high quality candles and candle accessories with fabulous selections that will be perfect this spring. The spring collection is vibrant and bright with unique scents featuring Tea Olive Bloom, Blueberry Scone, Orange Blossom, Sea Salt & Yuzu and Plum Orchid. My home smells wonderful when my candles are lit and my newest favorite is the Blueberry Scone candle. My husband and kids came home and immediately thought that I had baked blueberry muffins as the aroma of ripe, juicy blueberries, butter cake, vanilla and almond was inviting and yet not overpowering at all. It has an authentic scent that doesn’t smell artificial and my husband was quite complimentary of this spring candle from Colonial Candle. The bright blue colored candle in a 22 ounce oval jar candle (SRP $25) was the perfect way to make our home more cozy and inviting. It is hard to describe in words just how wonderful the scent is as featured in the Sea Salt & Yuzu candle (SRP $15/ 8 oz. oval jar candle). This invigorating combination made me feel as though I was sitting by the sea shore surrounded by citrus notes of grapefruit, yuzu and lime…..just fabulous. The bold yellow color is a wonderful way to brighten up any room and this candle is unique, vibrant and perfect for the spring season. As a life-long Florida native, I knew that I would love the Orange Blossom candle (SRP $7.50/ 3.5 oz jar candle) and it did not disappoint. It had a surprisingly complex fragrance that successfully captures the authentic scent of blossoming orange flowers with a hint of lime, cilantro and kiwi. The most pleasantly surprising scent that I sampled from this spring collection is the Tea Olive Bloom Simmer Snap Candles (SRP $4.00). I normally prefer fruity scents over floral but this is the perfect blend of white flowers, apricot, plums and saffron. It smells absolutely amazing and I love to use these in my warmer in the evening when I am relaxing with a good book and a cup of tea. You are invited to visit Colonial Candle to browse the entire selection of candles and accessories. I am always very pleased with the quality of all of the products we use in our home from Colonial Candle. I really appreciate the wide selection and attractive pricing for virtually every budget. Which scent in the spring collection would you love to brighten up your home? Carnival sounds like a fun summer scent. The Pina Colada would smell great for Spring or Summer. The French Lavender or Tibetan Sandalwood both sound great! I like the Caipirnha Simmer Snaps scent. Berry Sorbet would be a great Spring fragrance! White Jasmine and Freesia sounds good. I think that the Clementine Cupcake and Daffodils+Daisies Candles would make great spring scents. I would like Island Pineapple! Grapefruit And Wheatgrass sounds springy. I think fresh picked cotton or simple breeze would be great spring scents! The Pina Colada would smell wonderful for Summer.. like a day at the beach. Berry Sorbet sounds like a great one to try. I would like to have the Strawberry Daiquiri scented candle. Guava and Papaya sounds great for spring and summer. i think that i would really enjoy the pina colada scent. I think Wild Iris would be great. Orange Blossom would be great for spring! I would love the Island Pineapple! I would like to try the rosewood scented candle for summer. Mmmmm…. I would love cranberry cosmo. Thanks so much for the chance to win this. Vanilla Lavender is the one I would love to try! Thanks for the giveaway… LEMONGRASS & CILANTRO ! I think French Lavender or Island Pineapple sounds awesome! I would love the Plum Orchid, but also like the Simple Breeze scent too! For me, sea salt and vuzu.